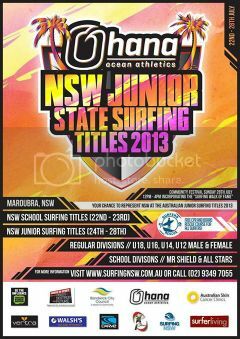 Ohana NSW Junior State Titles 2013 runs July 22nd - 28th at Maroubra Beach, NSW. In the U18's are Jake Snellgrove and Mikey Wright. In the U16's are Zac Wightman, Zak Condon, Luke Condon and Jake Schindler. In U14's is Mikey McDonagh. Good luck groms. An amazing result today in the NSW School Surfing Titles with Zac Wightman and Luke Condon finishing 1st and 2nd respectively in the Under-16 Boys All Stars final. Cali McDonagh also smashed it for a win in the Under-19 Girls All Stars final. Day 3 started today with the U18's and U16's hitting the water and a dramatic increase in swell and wind. Former Australian Junior Champion Mikey Wright kicked his campaign off with a bang, bashing out multiple backside snaps and critical bottom turns, locking in a heat total of 15.17 to claim victory. "It's definitely windy out there, but the swell has picked up a fair bit and there's a solid left coming through. If the wind dies down it would be a lot better. I'm in the event to try and simply have some fun and see how everyone is surfing at the moment." "I guess my game plan for the event is to just get two good waves early in the heat and then just have fun from there." 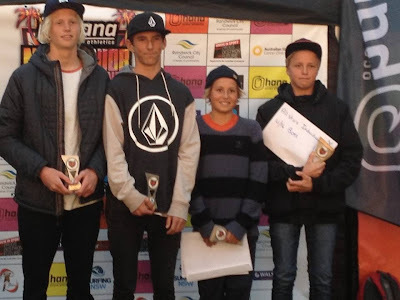 Following on from his impressive win in yesterdays Under-16 Boys All Stars final, Zac found his rhythm in the punchy lefts to also claim a victory in his round one heat. Zak Condon also notched up a round 1 win. Luke Condon also progressed in the 16's. Unfortunately the 2 Jakes were eliminated. 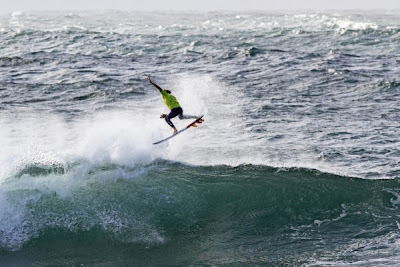 A clean and punchy south-easterly swell rolled into Maroubra for the fourth day of the 2013 Ohana NSW Junior State Surfing Titles. Mikey had another big heat win scoring a 16.83 heat total. 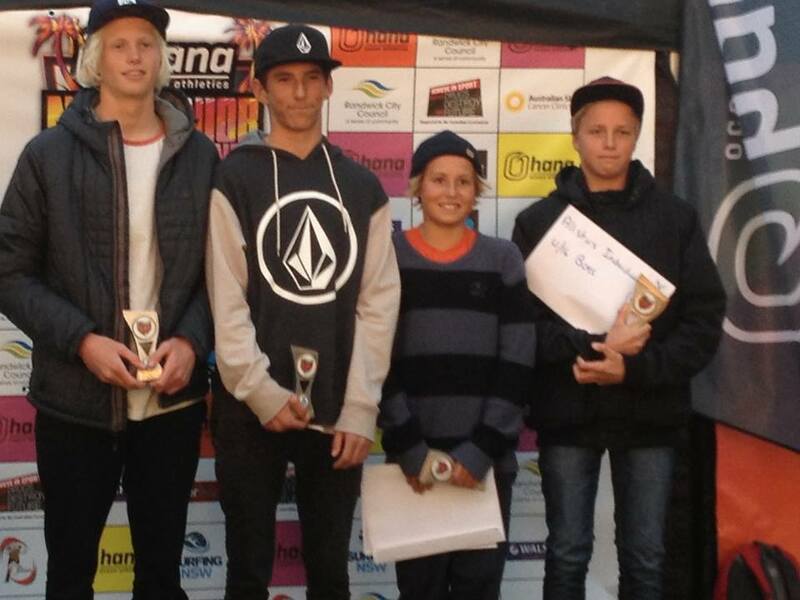 Zac progressed into the quarters of the 16's but both Condon groms were eliminated. Mikey Wright continued to amaze the crowd over the course of his Under-18 quarter and semi-finals locking in excellent scores, including a perfect 10.00 ride. "I'm just approaching each heat with the intention of having fun. The waves are pretty pumping out there, so I've just been enjoying each heat as it comes. I guess I'm just really happy to have moved into the final. I'm looking forward to it." Unfortunately Zac Wightman went out in the quarters . Cali McDonagh smashed it again on her way to the final. After winning every heat on the way to the Final, Mikey Wright finished 2nd to local grom Monty Tait despite scoring a 9.50 for a massive air. Mikey McDonagh won his quarterfinal and semifinal but finished 4th in a stacked U14's final. Cali McDonagh didn't drop a heat until the Final where she finished 3rd in the U18's Girls.